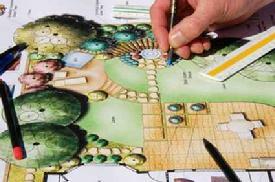 What is landscape design? To be sure, both "landscape" and "design" are common, everyday words -- not terms that would send you scurrying to a dictionary. But asking ourselves as do it yourselfers exactly what landscape design entails is a useful exercise: by exploring all of its ins and outs, we may discover an aspect of this diverse field that we've been overlooking all this time. Let's begin answering the question with a basic definition of landscape design for homeowners that considers both aesthetics and energy conservation. This definition, however, raises the questions, "Aesthetic for whom?" and "Practical for whom?" The issue of aesthetics, in particular, is fraught with subjectivity. Frankly, what I find to be an ideally attractive landscape might not excite you at all. But this does not mean that nothing needs to be said about landscape aesthetics for the do it yourselfer. You may have your own distinct tastes, but there are still useful guidelines to discuss that will help you achieve maximum aesthetic impact on your landscape. If your property is destined for the real estate market, please consult an expert to learn specifically about sellers' guidelines; essentially, you will need to take into account the tastes of potential buyers. If, instead, you are landscaping simply to suit your own tastes, you'll want to keep in mind the general design guidelines for landscape aesthetics discussed in Part 2 and Part 3. How will your yard be used? Do you have children who are active outdoors? Do you yourself plan on using your yard for exercise, sports, or entertaining? Answering these questions will help determine the appropriate landscape design for your needs. Extensive lawn space is useful in a yard that will see a lot of social barbecues, badminton and ball playing. But if you are more interested in turning your yard into a retreat meant for serenity, solitude and contemplation, the role of turf grass may be reduced drastically in favor of trees. Evergreen trees planted to the north and west of a home can serve as windbreaks.By breaking the wind, such trees will reduce your heating costs in winter. Likewise, shrubs used as foundation plantings can reduce heating costs, creating an insulating dead air space around the home. Plant the shrubs 5' away from your foundation. But after such practical concerns have been addressed, you'll still want to make your landscape design as aesthetically pleasing as possible. The nursery and landscape industry is made up of thousands of small family businesses that grow, retail, install, and care for plants and landscapes. As community-based small businesses, owners and principals are deeply involved in their communities, as employers, taxpayers, and leaders. While the number of U.S. farms of all types has declined over the last two decades, the number of nursery and greenhouse farms has increased. Grower cash receipts from nursery and greenhouse sales (on sales of plants to retail and distribution businesses) have grown steadily over the last two decades and are increasing at approximately $500 million per year. Of the estimated $45 billion in U.S. horticulture sales in 2003, floral and nursery crops contributed a third, or $15 billion. The U.S. is the world's largest producer and market for nursery and greenhouse crops and these crops represent an important and unique segment of agriculture whose impact is felt on the national, state, and community level. In terms of economic output, nursery and greenhouse crops represent the third most important sector in US crop agriculture, ranking seventh among all commodities in cash receipts, and among the highest in net farm income. Seven states account for almost two-thirds of all nursery-crop output in the United States: California (24%), Texas (11%), Florida (9%), North Carolina (9%), Oregon (7%), Ohio (4%) and Maryland (3%). The nursery and landscape industry employs over 600,000 workers during peak seasons. Growers employ at least 45,000 workers year-round and 105,000 during peak seasons. Net farm income is the highest of any production specialty in U.S. agriculture. At an annual average of $53,589, nursery and greenhouse income is four times higher than the U.S. average ($13,458). Landscape and retail firms employ nearly 500,000 full-time, part-time, and seasonal workers. Seeds, roots, stems, leaves, flowers, fruits -- if you understand how these basic plant parts function, both individually and together, you'll find all aspects of gardening and plant care more comprehensible, manageable, and enjoyable. Although leaves vary in appearance and structure (a few examples are shown at right), all have as their basic function the manufacture of sugars and other carbohydrates through the complex process of photosynthesis : the interaction of light energy with chlorophyll (the green material in leaves), which converts carbon dioxide from the air and water from the soil into sugars and oxygen. Photosynthesis requires large amounts of water. Once this water is drawn up from the roots through the stems and into the leaves, it encounters carbon dioxide, which has entered the leaf through the stomata, minute pores located primarily on the leaf undersides. Besides allowing the inflow of carbon dioxide from the air, the stomata permit the outflow of oxygen, which is a byproduct of photosynthesis, and of excess water vapor (transpiration). Since a leaf's interior tissues must be moist but outside air is often dry, the stomata can close as needed to prevent dehydration. Leaves can be further protected from drying by an outer coat (epidermis) that may be hairy, extra thick, or waxy. Photosynthesis comes to a halt in deciduous plants during their leafless dormant season, and it slows greatly in evergreen plants during their modified dormancy in cold weather. For this reason, most plants require much less water from late fall to early spring, so gardeners can dig and move them with less damage during this time. Anything that interferes with photosynthesis and the subsequent transfer of sugars throughout the plant can have harmful consequences. For example, if leaves are cut by pruning or chewed by insects, the injured tissue may seal to prevent the loss of moisture--but the leaves will not regrow, and the area available for nutrient manufacture will be decreased. Soot, grime, and dust on leaves can interfere with free air circulation through the stomata and reduce the amount of sunlight available to the leaves. A smothering mat of leaves on a lawn can halt the production of chlorophyll in the grass, causing it to turn yellow and stop growing. 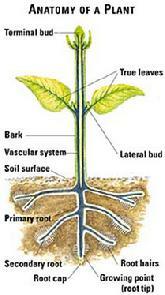 Plants won't grow well aboveground if their roots don't have favorable conditions below ground. 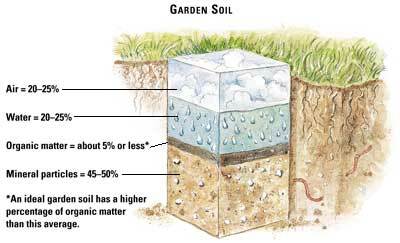 Learning a few basic facts about your soil will let you know what improvements may be needed before you plant -- and you'll have a better idea of the right way to water and fertilize your garden, too. Fertilizer sections at nurseries, garden centers, and supply stores dazzle the gardener. The shelves are piled with boxes and bottles, the floors covered with bags stacked high. Labels identify the package contents as "rose food" or "vegetable food," "lawn fertilizer" or "general-purpose fertilizer." In some stores, you'll find bins filled with bone meal, blood meal, or hoof-and-horn meal--all labeled "natural fertilizer." Choosing the right products to keep your plants healthy can often be a bit confusing. Regardless of its type, any fertilizer you buy will come with information about the nutrients it contains. Prominently featured will be the N-P-K ratio, the percentage the product contains by volume of nitrogen (chemical symbol N), phosphorus (P), and potassium (K). A 16-16-16 fertilizer, for example, contains 16% nitrogen, 16% phosphorus, and 16% potassium. A 25-4-2 formulation contains 25% nitrogen, 4% phosphorus, and 2% potassium. All fertilizers contain at least one of these components; if any is missing, the ratio will show a zero for that nutrient (a 12-0-0 fertilizer contains nitrogen but no phosphorus or potassium, for instance). Boxed, bagged, and bottled products display the N-P-K ratio on the label. For fertilizers sold in bulk from self-serve bins, the ratio is noted on the bin; for future reference, be sure to write the information on the bags you fill and bring home.